Taco SKV Self-Sensing Vertical Inline Pump - BBC Pump and Equipment Company, Inc. 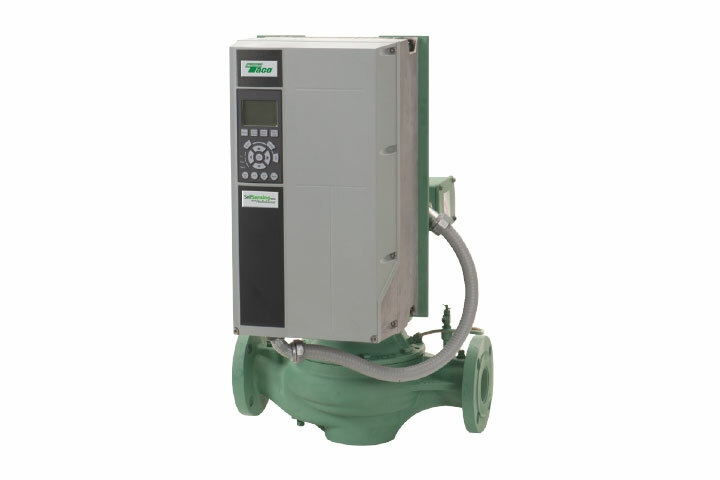 The Taco SKV self-sensing close-coupled inline centrifugal pump is a giant leap forward for variable speed pumping: the Self-Sensing Series with ProBalance®. At the heart is the patent pending SelfSensing ProBalance technology. The VFD’s SelfSensing capabilities make fast, accurate do-it-yourself system balancing easy. Reduced balancing contractor costs, no expensive wiring, and no additional sensors required. Apply to ALL your pumping needs: both constant flow chiller/boiler pumps and secondary variable flow pumps! Available with ECM motor options and eLink™.